Schema Registry stores all schemas in a Kafka topic defined by kafkastore.topic. Since this Kafka topic acts as the commit log for the Schema Registry database and is the source of truth, writes to this store need to be durable. Schema Registry ships with very good defaults for all settings that affect the durability of writes to the Kafka based commit log. Whenever in doubt, leave these settings alone. Please refer to Operations for recommendations on operationalizing Kafka and ZooKeeper. To protect against complete loss of DC A, Kafka cluster A (the source) is mirrored to Kafka cluster B (the target). 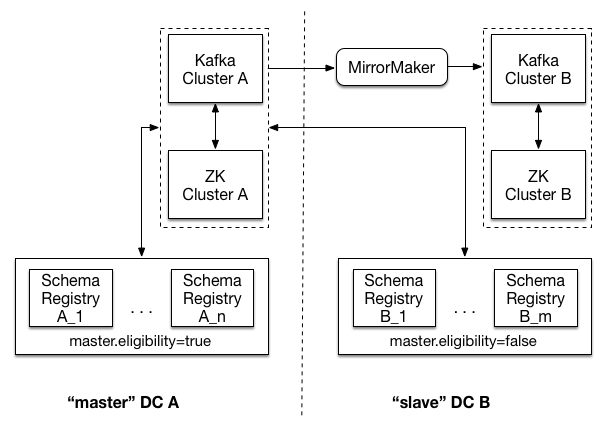 Mirroring is achieved by running Kafka’s MirrorMaker tool local to the target cluster. In DC B, run MirrorMaker with Kafka in the “master” datacenter as the source and Kafka in DC B as the target.